Job posting for social media strategist. We’re looking for a social media strategist who can work with a team to create innovative visions for online community and social media projects, and turn those visions into reality. The right person is great with people, words, technology and details. 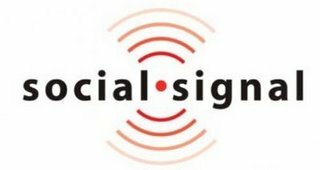 Social Signal is run by Alexandra Samuel and Rob Cottingham (who creates the phenomenal Noise to Signal cartoons), two amazingly creative and strategic people. Could be quite an incredible opportunity for the right person, and I wanted to pass it along to my readers. Interested? Read the full job description, or apply now. A whole ‘nother level of online community. I love Open Source software. The self-organizing of people to collaboratively create something they feel is worthwhile is an amazing model. …you use it to tell the creator of a change or the writer of a blog post that you’re inspired by what they’re doing… and you want to hear more. Click it, and ChangeEverything.ca instantly sends that person an email – including, if you want, a personal message from you. But the thing I love most about it is that when we wanted to add this feature to the site, there wasn’t a module available that did this. So after custom-developing “nudge” for the CE community, we released it free to the world as a module for any Drupal site. UPDATE: Here’s a post on the subject from Social Signal.